Like my Sri Lankan Fish Cutlets recipe, this recipe takes fairly basic ingredients and turns them into a dish that’s full of complicated, surprising flavors and very easy to serve people. 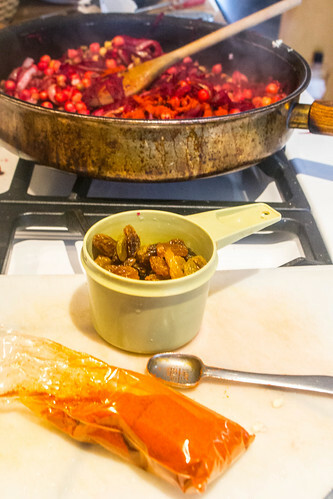 The recipe came from Louisa Shafia’s New Persian Kitchen cookbook, with a few adjustments for my friends’ allergies and to make it more convenient for pantry cooking. 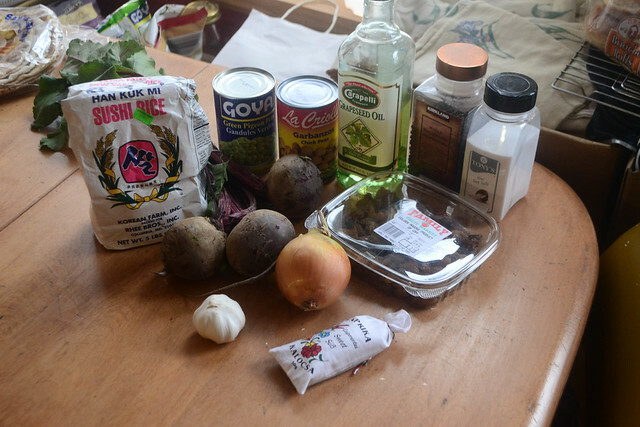 Except for the single beet and the sushi rice, it is easy for me to keep the ingredients on hand if I need a vegetarian dinner or just want something fast to eat. The only spice you’ll need is sweet smoked paprika – you could use regular paprika if you don’t see that variety available, but it’s worth it to get the good stuff if you can. 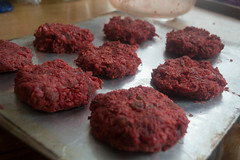 A single egg is the only ingredient making it non-vegan, but the beet color makes them look surprisingly similar to a rare beef hamburger. That may or may not make it any more attractive to you. 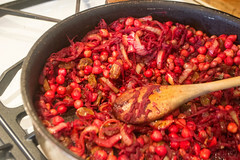 The first time I made this it seemed a bit complicated: but that was probably because I was trying to make four things at once and not following the recipe very carefully. That doesn’t help, it turns out. It went much faster the next time. 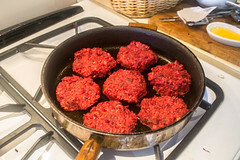 I’ll note what order it helps to put it together for the least fuss, but you can also divide up the work – mix it up ahead of time, then cook the burgers just as you want to eat them. 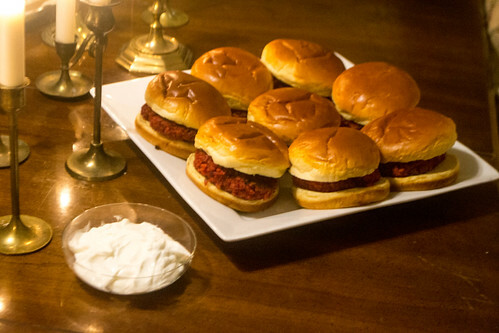 I’ve served them with or without buns, if you need to avoid gluten they’re still pretty appetizing food without that. Start by cooking the rice, if you don’t have leftovers. Sushi rice is stickier than the normal long grain rice we normally eat, which helps these hold together. If you don’t have any, you may need to add another egg. We use a rice cooker, but I have to remember to set it aside to cool so it doesn’t get scrambled egg in the mix when you stir it together. 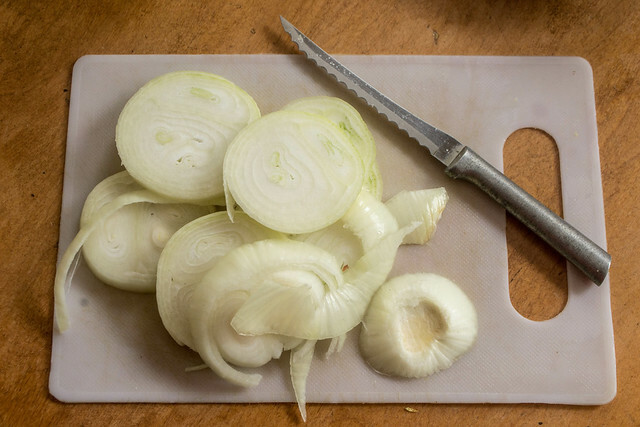 Next, slice the onion into 1/4″ slices and saute in oil over medium-high heat for 10-15 minutes, or until it is cooked soft and beginning to brown. 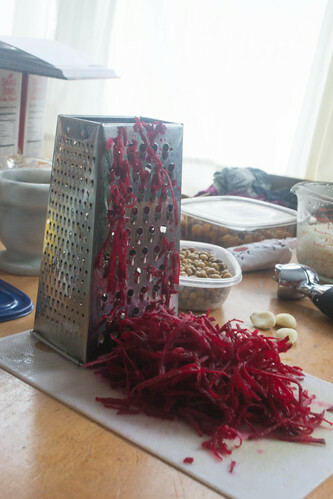 While it cooks, peel and grate the beet and gather the beans and seasonings. 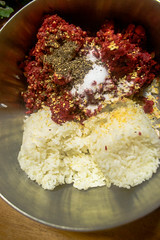 Turn down heat and mix in the remaining ingredients except for the rice and egg. Cook for 10 minutes until softened, stirring often. 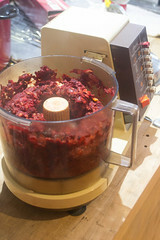 Transfer skillet contents to a food processor and mix until it forms a chunky paste. Also, you could look crazy. But maybe that’s just me. 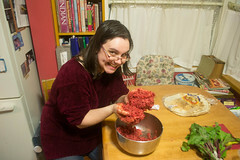 Stir into the rice and egg and mix well – easiest to do with your hands, though it will look a bit messy. 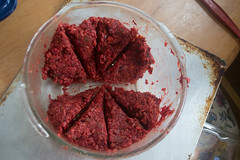 Divide dough into 8 portions and shape each into a patty – about 3/4″ thick and 3-4 inches across. 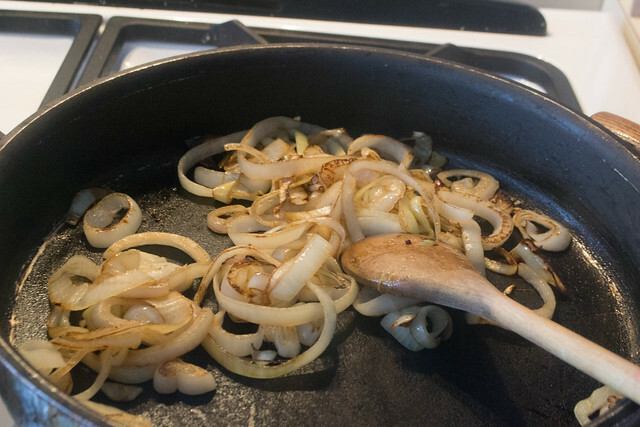 Heat your heavy skillet again over medium-high heat (if you use the same skillet, wipe it down so any remaining vegetables don’t burn quickly) and add oil to coat the bottom. 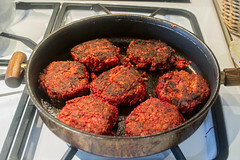 Place burgers in the skillet and cook at medium-high heat for 5 minutes without moving them. Gently flip them, turn down the heat, cover the pan, and cook for another 10 minutes. This should give them a nice crisp crust on each side. 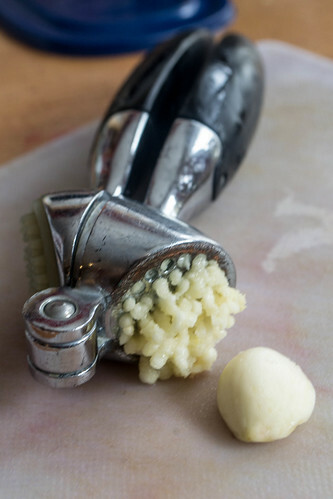 You can make the mix ahead of time and cook them just before serving. 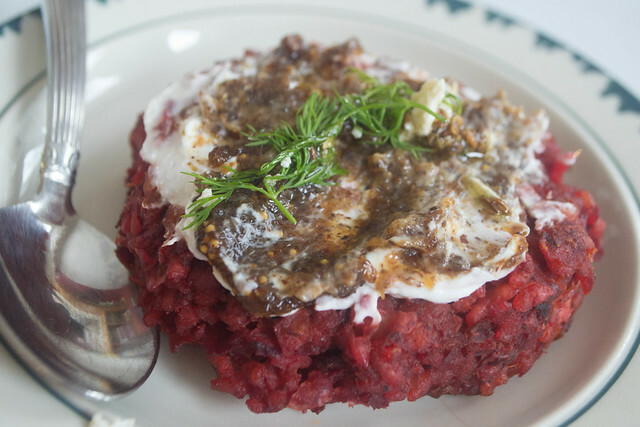 I like to serve these with yogurt and dill – but you can add whatever toppings you like: a chutney or mustard, sliced veggies, etc.